Goodenbergh Holiday Park is less than 4 miles from the town of Ingleton in North Yorkshire, famous for its natural and man-made features. Handily located along the A65, Ingleton is easy to get to and offers some of the most scenic views in North Yorkshire, making it a very popular tourist destination. Ingleton is the self proclaimed Land of Caves and Waterfalls. One of the main attractions is the Ingleton Waterfalls Trail, a circular 4 and a half mile walk that has some of the most spectacular waterfalls in the North of England. There is also the White Scar Cave and Ingleborough Cave, both offering guided tours of some of the most impressive caves in the area. Holiday Parks for those that hike. A short distance away you will also find the fells of Pen-y-ghent, Whernside and Ingleborough. These make up the Yorkshire Three Peaks and is often walked as a challenge to complete each within a day. On their own they make stunning hikes, offering very scenic panoramic views of the Yorkshire Dales. Being so close, Goodenbergh Holiday Park is an ideal base for exploring the many, many visiting spots that Ingleton and the surrounding area has to offer. Our Holiday Park comprises of privately owned holiday homes set among beautiful woodland with areas for recreational use. 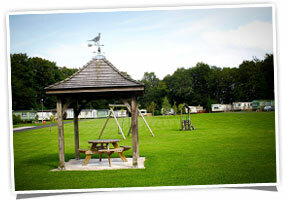 We provide pitches for holiday homes as well as sell a section of new and used homes. Our Luxury Holiday Cottages also offers year round accommodation for anyone wishing to stay at our Holiday Park. Both are converted to a high standard with modern fixtures and fittings to make your stay as comfortable as possible.